Written on October 18, 2016 . Posted in Architecture and Design. 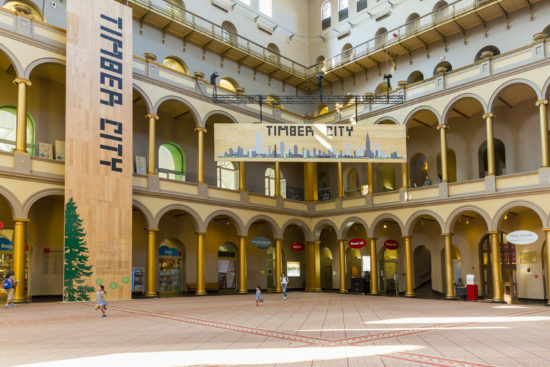 Yugon Kim (Critic, Interior Architecture) has curated and designed an exhibition, Timber City, currently on show at the National Building Museum (401 F. Street NW, Washington DC) through 21st May 2017. Timber City challenges the notion that wood is an antiquated building material by demonstrating the wide range of benefits offered by cutting-edge methods of timber construction, including surprising strength, fire resistance, sustainability, and beauty. The exhibition examines the recent boom in timber construction worldwide and highlight U.S. based projects, including the two competition winners of the recent Tall Wood Building Prize, sponsored by the United States Department of Agriculture (USDA). 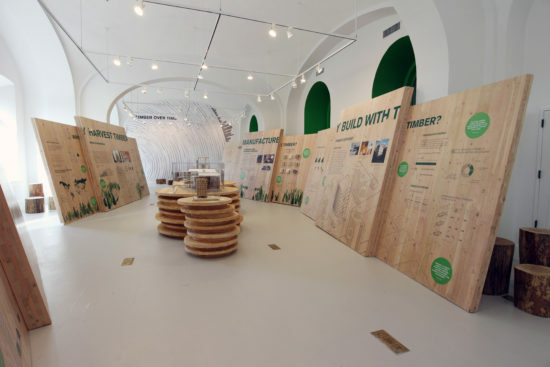 Immersive installations examine recent innovations of timber technology, especially cross laminated timber, known as CLT. 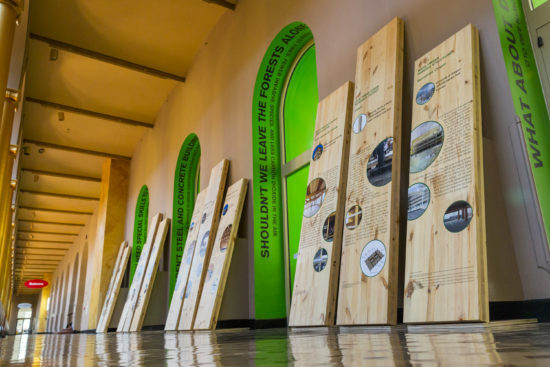 Displays also show how U.S. based timber production can help revitalize rural manufacturing communities and benefit urban centers in a wide range of ways. Two American-manufactured massive timber panels have been installed in the National Building Museum’s historic Great Hall. The vertical panel stands 54 feet tall, soaring to the Museum’s third floor level, and the horizontal panel is 40 feet wide. Timber City is funded in part by the USDA Forest Service and the Softwood Lumber Board.